This is episode 67 of The Drone Trainer Podcast! In this episode, we’re going to hear from Danny Engesser, a drone pilot based in Iowa. Check this episode out and subscribe on iTunes or Google Play so that you don’t miss this or any of the future podcast episodes! Danny Engesser is an IT professional who has been running his drone side hustle for the past year. He started off with a Parrot AR, and has since moved up to the DJI Phantom 3 Advanced and now the Inspire 1. So far he’s been working in a variety of industries including energy, car dealerships, and corporate group photos. Utilizing the LAANC system (Low Altitude Authorization and Notification Capability), Danny has been able to fly missions in a variety of controlled airspace. So far he’s found the system to be fairly straightforward, and hasn’t had any issue on obtaining airspace permissions. While in the air, Danny prefers to use the DJI Go app, however has been tinkering with Litchi as well lately. I’ve used litchi myself, but we also discuss my personal preference of Hangar’s Autopilot. Danny mentions that he had some trouble with the Inspire 1’s firmware, and figured out a way to downgrade it to the original settings. It takes some work, but he has posted instructions for how to make this happen. I haven’t had to try something like this, but it looks like a good option for drone pilots that are having issue with their firmware and want to start over from scratch. Alternatively, you can use my method of refreshing the firmware to keep things up to date with a clean install. For insurance, Danny choses Verifly to cover him on a flight by flight basis. So far he’s had pricing ranging from $10 up to $130, with the increase likely based on the operational airspace. There may be a few other factors that cause the price to jump, but in his tests he’s found that small adjustments have caused significant price changes. 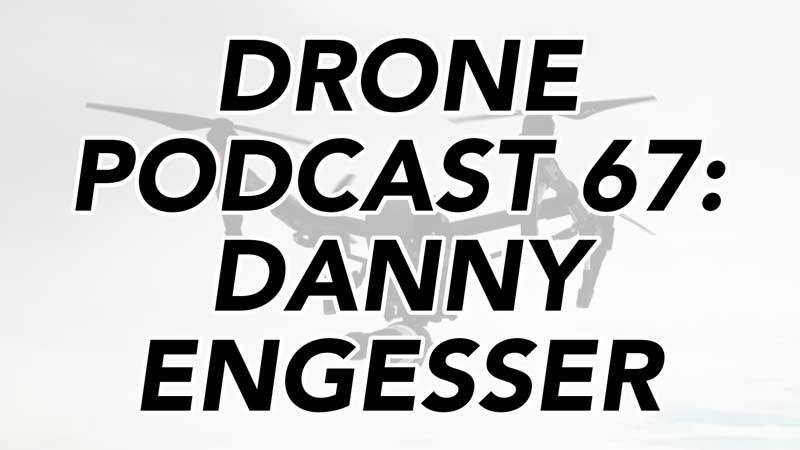 I hope you enjoyed this week’s drone podcast with Danny Engesser! Once you’ve had a listen, feel free to leave a comment below so that Danny and I can hear what you think! Check out Danny’s work and follow him on social media!